On Saturday I took Kili and Truman into their aviary together for the first time. 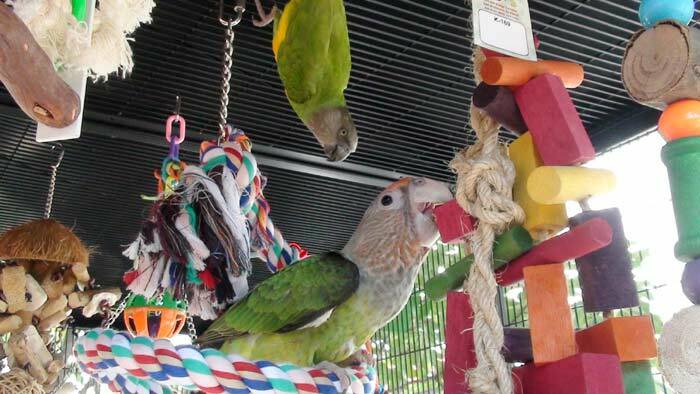 I finally added toys and perches to the aviary, some old and some new. Many of them you might recognize from Truman's toy shopping I did after getting him. Unfortunately cause of his injury much of that had gone unused for a while but came in quite handy for decorating the aviary. 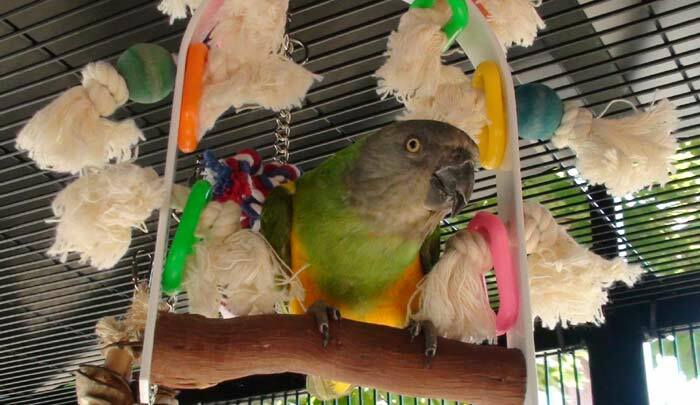 I reused many of Kili's old swings though to make comfortable hanging perches for her. Truman just hung out wherever I'd put him. Kili got comfortable quite quickly and was moving from perch to perch. Sometimes she would fly but mostly she found it more convenient to climb up the toy to the ceiling bars, hang upside down, make her way across the ceiling, and then down the chain for the next toy. 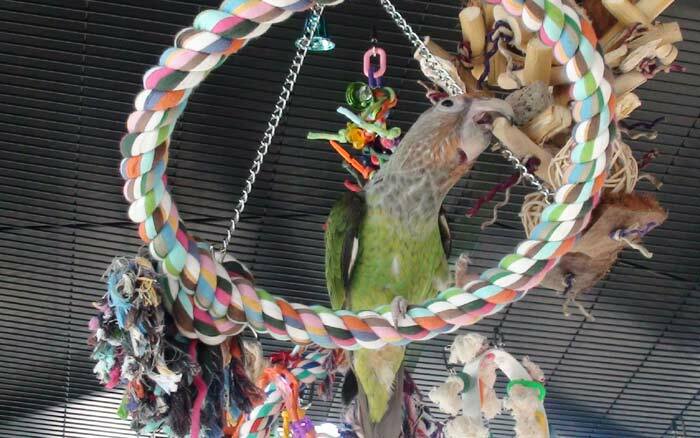 The boing spiral rope perch quickly became Kili's favorite. 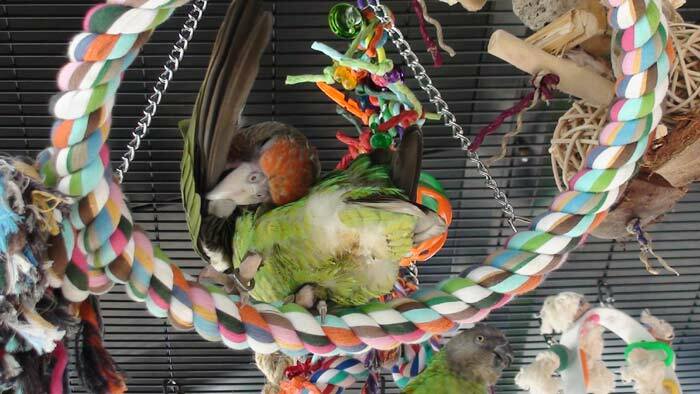 This is a bit of a problem because when I put Truman on that and Kili elsewhere, Kili flew over and started attacking Truman until he fell off and landed on the aviary bars. 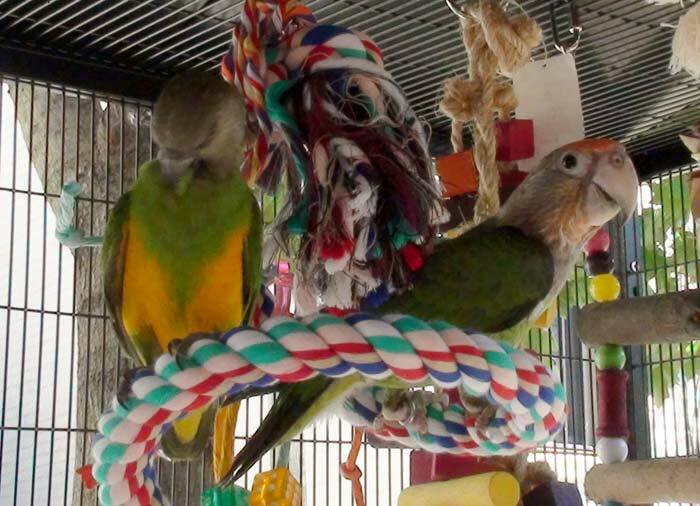 This is why for the time being I am keeping Truman in the aviary daily (when weather and time permits) but only putting Kili in on occasion when I can be inside to supervise. I want Truman to become more familiar with the aviary so he could have at least a little advantage over Kili. Until I can feel confident that Truman is healed and that Kili cannot hurt him, I have to stay inside whenever they are together. 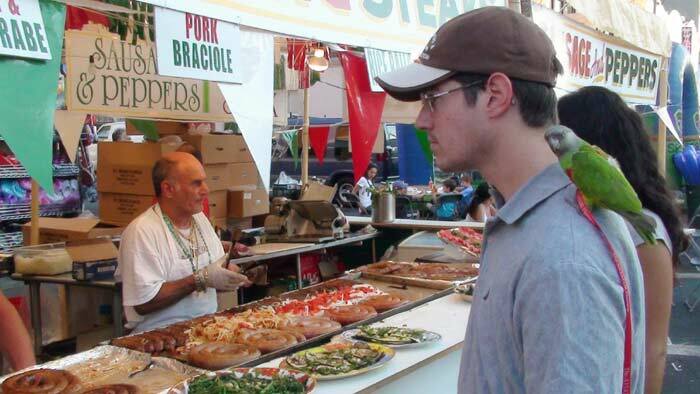 For the next few weeks there is a street fair going on nearby so I've been taking Kili there quite frequently. I am using this as a way of desensitizing her to people and noise because some day I might have to take her to a TV studio. So to teach her not to be scared of novel environments, I think these outings are very effective. The first time I walked through the fair I had her perch on my hand and held her leash pretty tightly. She can only fly to the end of the leash but in such tight crowds I could not risk her going even that far. As we continued, Kili was becoming much more relaxed and used to the situation so I let her sit on my shoulder the entire way back. I have brought her several more times since. With every successive time I bring her, the less time it takes before I can stop holding her and just put her on my shoulder. She may flinch a little when a balloon pops but she does not try to fly away. There was not a single time she tried to fly off and in fact the more scared she is, the tighter she clings to me instead. So even without a harness I could have made all of these outings much the same way. It's just that in that very unlikely even that she does try to fly off, the harness is my backup plan. Kili would get really vocal during these walks with many "hellos" and noises that she does. A girl wanted to hold Kili so I let her. She began asking if it's ok to pet Kili and just as I was uttering the word no she stuck her finger in and got a good bite. Didn't have the patience to hear the answer. Really it is ok to pet Kili but only in a certain way. She didn't give me the chance to show her. But hey, a good lesson for the girl no less. She was surprised that parrots can bite but really I would not even classify it a parrot bite as there wasn't any blood. Some other parrot owning people took notice and wanted to talk. I was surprised that otherwise these parrot outings went quite unnoticed. Typically Kili brings out a much bigger gathering at the park. Wow! That aviary looks like so much fun for those two. Kili reminds me of my Senegal, Sammy. He's really bratty sometimes and isn't the greatest at sharing. He even takes on my African Grey from time to time. And the funny thing is, the Grey backs down. What a great idea to bring Kili to the carnival for exposure. You guys look like you had a good time. Love the part about the girl getting bit. You're right about "no blood" bites. They can hardly be classified as a bite at all. Good learning experience for her for sure. TV should be in Kili's future. I am surprised that The Tonight Show hasn't contacted you yet. There's a place on their website to recommend an act. Maybe we should write in and get you on there! You need to be recognized in the US and not just overseas. BTW-I got a forwarded email yesterday from somebody that said "This guy is great! 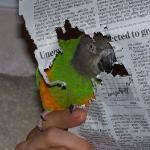 You've gotta see this parrot!" It was your YouTube video of the 20 tricks. Don't know where he got it, but that forwarded email had a long, long line of forwards behind it. Haha, that's great. I pretty much had to turn down an offer to appear on the George Lopez Tonight Show because Kili's wings are still really bad. She finally got a second primary molting in recently and just yesterday it broke so she's back to just a single primary with no foreseen prospects of recovery. She can still fly but it's really hard for her so she's not enthusiastic about doing it on cue like she used to. And I don't push her cause right now I want her wings to mend. I even took her to the vet about it today. I'll try to post about that later. It may have been challenging to assemble, but the aviary looks very nice, especially with the toys and perches and Kili and Truman inside. I really enjoy the videos that you include with your posts. Wow, aviary looks great! Lucky birds!